満鉄刀「興亜一心」、「天草丸」South Manchuria Railway's swords "Kōa Issin-tō","Amakusamaru""
South Manchuria Railway's swords "Kōa Issin-tō","Amakusamaru"
South Manchuria Railway's swords "Kōa Issin-tō"
The small stamp of the "Tō"
(East) of a Kanji character. Is it an inspection mark ? 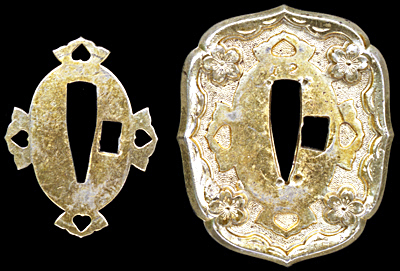 A mallow-shaped guard without an openwork: Seto plating finish. of a guard calls it an "Mimi" in Japanese. Mallow-shaped Large washers:　It is usually red paint. This Large washers is in the state which paint has peeled off. Therefore, a color is with the skin of a brass. Mantetsu(SMR=South Manchuria Railway Co,Ltd.) studied the Japanese sword thoroughly. Man-tetsu SMR studied the Japanese sword thoroughly. As a result, SMR made the Japanese sword of the industrial commodity by the power of modern science. Mantetsu-tō is a common name. An official name is called "Kōa-Issin-tō." Mr. Kanji Naruse has described it as "Mantetsu-tō is the blade forged by two-piece sword construction, and is pliant like an old sword. A "Talk of a battle sword" of his work. 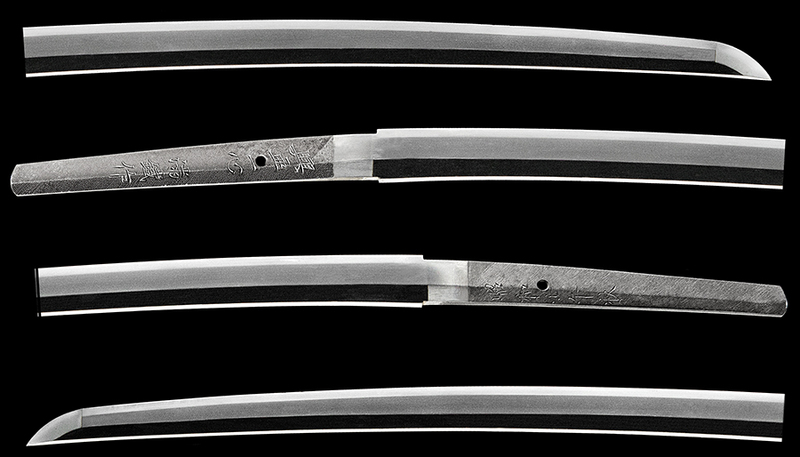 This sword is a beautiful blade with the tempered line of Naka-suguha and Nashiji-hada. 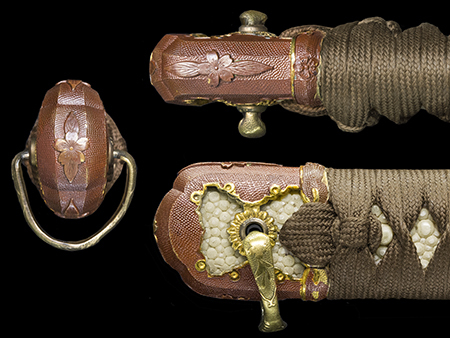 It was proved that a blade was a very excellent practical use Guntō by a battle. 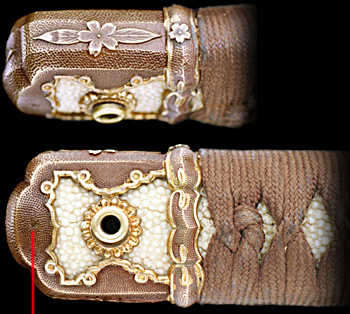 Detailed contents are referring to the following "Mantetsu-tō's whole aspect." Iron scabbard: Brown semigloss coating. 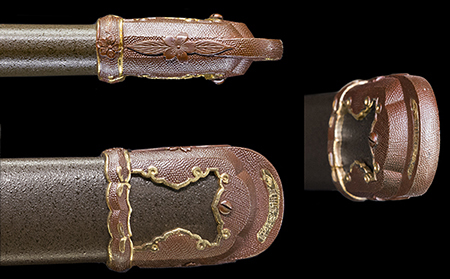 A guard without an openwork, Spring-clip. This Guntō is near intact. The state of those days made miraculously is held. A middle type guard without openwork.The stamp of Tokyo Wakase Gunto factory. "Amakusamaru" is not a swordsmith name.